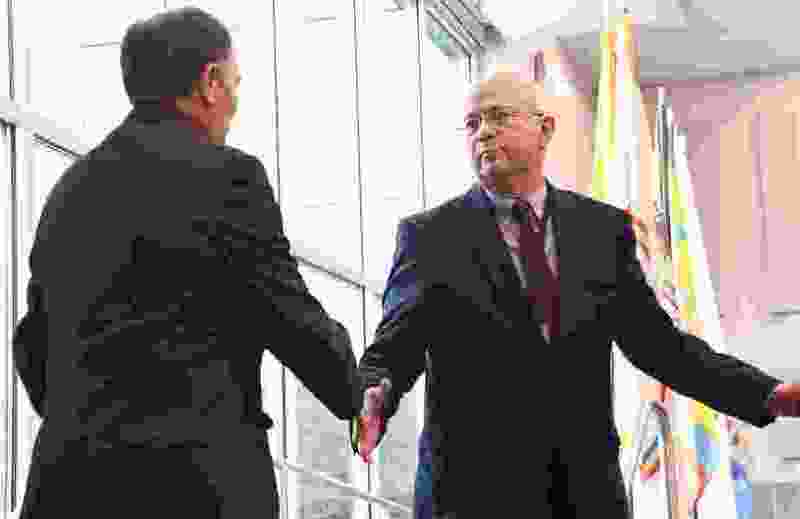 (Francisco Kjolseth | The Salt Lake Tribune) Larry Echo Hawk, right, special adviser on Indian Affairs, shakes hands with Gov. Gary Herbert on Monday, Feb. 4, 2019 at the Utah Capitol, after making a few remarks about his role in building better relations with the state's eight tribes, some of who's positions differ sharply with Utah's political leadership. Gov. Gary Herbert on Monday introduced the newest member of his administration, Larry Echo Hawk, whom he recently hired as special counsel for Indian affairs. Echo Hawk is a prominent Democrat who served as Idaho attorney general and later in the Obama administration as assistant secretary of the Interior for Indian affairs. He spent nine years as general counsel for Idaho’s largest tribe, the Shoshone-Bannock of Fort Hall. Now he will serve Utah’s Republican governor and Attorney General Sean Reyes in an effort to build better relations with the state’s eight tribes, some of whose positions differ sharply with Utah’s political leadership. Echo Hawk, 70, an emeritus general authority of The Church of Jesus Christ of Latter-day Saints, recounted his interview with Herbert and Reyes, saying he didn’t expect them to choose him. The state is locked in sticky legal disagreements with tribes, particularly the Utes, who are suing Utah and local governments in the Uinta Basin in an effort to assert jurisdictional authority over the vast lands within the tribe’s original reservation boundaries. Five tribes, including the Utes and Navajos, and the state are on opposing sides in a lawsuit seeking to restore Bears Ears National Monument.